Head coach Rob Dengate praised a ‘solid performance against a much improved Dartford Valley side’. He went on to add ‘We reacted well to the performance of the away side by scoring five very well-worked try’s. Due to the long break from the intensity of league fixtures out execution wasn’t as high as it normally is. However, I expect this will improve as we get back into the league and cup fixtures in the coming weeks’. 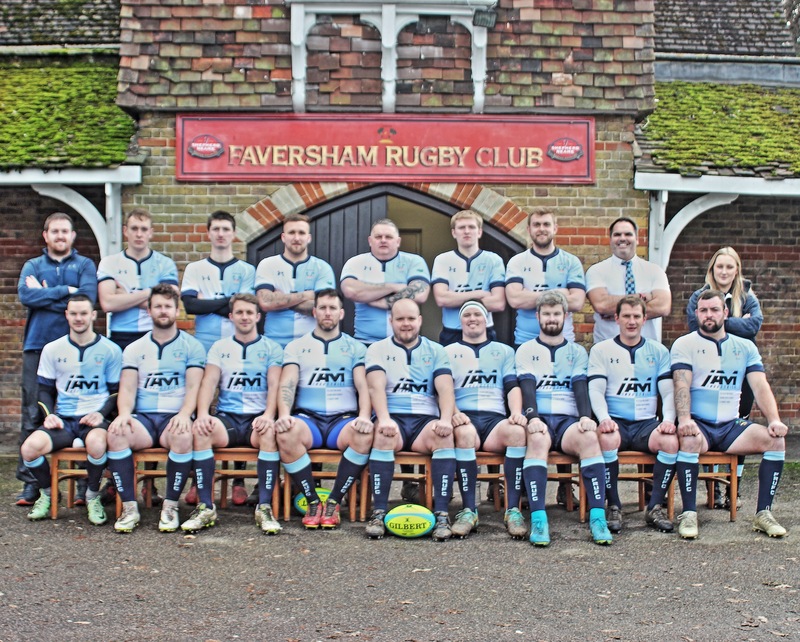 Faversham came into this game of the back of an eight week break from league rugby and struggled to match the intensity of their opponents during the first half. Dartford Valley seemed to be first to any loose ball and were consistently successful in getting over the gain-line, especially in the first twenty minutes. After five minutes ‘Valley were awarded a penalty in front of the posts from thirty metres out after Simon Jaynes failed to get back into an onside position before making a tackle. From this, ‘Valley opted for the points and their fly-half stepped up and slotted the kick to give the away side an early lead. From the re-start, ‘Valley cleared their lines and put Faversham back under immediate pressure. A clever line out ensured Faversham had quick ball and Mills showed his usual devastating power to get Faversham front foot ball. However, at the third phase ‘Sham were penalised after Harmsworth picked the ball up from an offside position following a knock-on. This gifted the opposition the chance to kick another three points and after ten minutes ‘Valley led Faversham 6-0. This seemed to kick Faversham into life. Jaynes sent up an inviting re-start and Egleton timed his tackle well to force a turnover in possession. A strong carry from Mills followed, sucking in a number of opposition players creating space for Faversham’s fly-half Jaynes to call a rewind. Jaynes (Ollie) found Hodges on a hard line outside him who broke the line before drawing the opposition winger and throwing a sumptuous no look pass out the back to Simon Jaynes, who was supporting him at pace. Jaynes then only had the full-back in front of him before slipping the ball to captain McDermott who ran in under the posts from around 15 metres out. Ollie Jaynes kicked the extras to leave the score at 7-6 to the home side. Egleton collected the ball on the 10 metre line from the restart and good rucking from the away side led to slow ball from Faversham’s scrum half Dave Tabor. When the ball did come, it was knocked on at the next phase following a hard press in defence form Dartford. Valley made their size advantage count at the scrum and won a penalty after ‘Sham was penalised for losing their bind in the front row. A good kick to touch from the away side led to them having a line-out just 10 metres from the ‘Sham’s line. The line-out was judged not straight by the referee however and ‘Sham had the chance to clear the lines from the following scrum. However, Dartford’s pack had different ideas. From the scrum, they drove Faversham off of their own ball. Miss communication in the back line led to the scrum half breaking through a huge dog-leg in the midfield and reinstated Dartford’s lead. Faversham were then unlucky not to hit back almost instantly. Jaynes sent another perfect re-start up and Egleton again timed his tackle well from kick off to push the away side onto the back foot. Further tackles from Kingdon and McDermott drove the away side back into their 22’ leaving them no option but to clear their lines. This then brought Faversham’s back three into life. Sanders-Champney collected the high ball well and had Gray on his shoulder in support. Gray’s presence left a hole for Sanders-Champney to exploit, before he passed the ball to Dan Hall out wide. Hall used his pace to get one on one with ‘Valley’s winger before he sent a delicate chip over the top for Gray to chase. Gray won the foot race and used his good footballing skills to fly-hack the ball on thirty metres before he was unlucky to not ground the ball for what would have been a stunning counter-attacking try. Faversham did hit back a few minutes later however. After a period of sustained pressure from Faversham’s defence, ‘Valley’s scrum half opted to box kick. Garnham produced a superb charge down before Simon Jaynes collected the ball and put his brother Ollie into space. Jaynes then find Tabor on an inside line who drew the full-back and slipped the ball to Hodges to finish a great move that saw Faversham regain the lead. Jaynes was unlucky to miss his conversion to the right of the posts, so the score read 15-13 to the home side. The away side once again failed to lie down and fought back by finding touch inside Faversham’s 22’ a few minutes later. Egleton found Kingdon at the back of a well worked 5-man routine which provided Tabor with clean ball for the back line. A wayward pass forced Sanders-Champney to collect the ball and under pressure did well to place the ball back over his own try-line. From the ensuing 5 metre-scrum, ‘Valley’s pack stayed tight and used their weight advantage to push ‘Sham over their own try line to score a push over try and make the score 20-15 in favour of the away side with 37 minutes on the clock. Faversham were looking like going into the break down on points, however a moment of magic from Mills ensured this was not the case. Faversham’s line out continued to function perfectly and Jaynes (Ollie) was found at pace by Tabor. However, miss-communication in the back line led to a lack of support and forced Jaynes to throw an optimistic pass out wide. This appeared to confuse the opposition and despite not reaching its target, the pass bounced perfectly for Mills to collect around the halfway line. He beat two men before creating a two on one with Gray outside him. Despite having the option of a walk in by passing to Gray with no one in front of him, Mills surprisingly decided to go alone. He did however demonstrate why he made this decision and used his power and skill to beat two more men before scoring a superb solo effort out wide. This meant the teams went into half time with the score level at 20-20. The second half was much more of a one sided affair. Faversham raised the intensity and were unlucky to only add two more try’s. The first came after 55 minutes. Faversham used their three-man line-out to create strong running lines in the midfield. Two strong carries created space out wide and quick ball meant Ollie Jaynes had options either side of him. A strong line from Hodges sucked in defenders and fly-half Ollie found brother Simon in space out the back. Jaynes then used his power to run in from the 22’ before beating the full back and crossing the whitewash to give Faversham the lead. The conversion was kick meaning Faversham now led 27-20. Faversham dominated the next twenty minutes and only a determined and resolute defence from Dartford Valley prevented the score line from being extended further. Faversham got close on a number of occasions. The most notable being Stacey Woolf crashing over from close range only for the referee to determine the ball was held up. Faversham did add to their tally however, with the last play of the game. Mills took a quick penalty and took the home side up to the 10 metre line with another bulldozing carry. Head coach Rob Dengate described what followed next as ‘one of the best try’s he has seen in a long time’. Jaynes got front foot ball and hit Egleton who ran a strong line on his shoulder. Egleton carried strongly before completing a one handed offload to Eddie Stott who was supporting him closely. Stott then beat two Valley players in contact before hitting Jaynes with another off-load. ‘Sham weren’t finished there however and Jaynes drew the last two defenders towards him before a final off-load to Luke Garnham sent the home side under the posts for a fifth and final try. It was a fitting end to a game where Faversham had improved as the match progressed. Faversham are now level on points with Sittingbourne in second place and eight points behind leaders Cliffe Crusaders, with a game in hand on both. Faversham travel to Ash in the quarter final of the Kent Salver Cup next weekend before travelling to Lordswood the week after in what will be a physically demanding encounter.